Is A Letter A Work of Art? It is no secret that I am passionate about letters…good old fashioned stick a stamp on the envelope letters. Don’t get me wrong. Texts and emails have their place, especially in business. We can be in touch quickly, and hopefully efficiently, with our newest form of common communication. But there is a special romance of anticipation when dropping a letter into a mailbox. And who can dispute the great joy felt when receiving a little part of someone’s day, set aside especially for you. Finding this quote dovetailed flawlessly into reading a letter sent by artist Frida Kahlo to Georgia O’Keeffe. Frida reached out with compassion to Georgia when she suffered with a nervous breakdown. The letter was not only the thoughtful gesture of a friend, but the meeting of two supportive inspired artists. 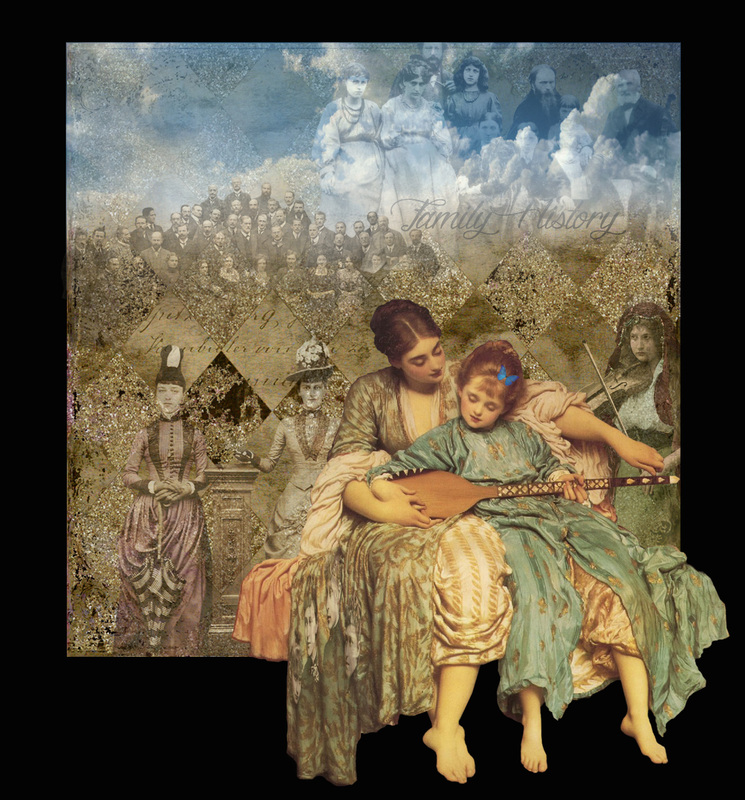 The May Lunagirl Moonbeam challenge is Mother’s and Sisters in the most encompassing sense. The images to choose from were lovely. I decided to use two women from the “Just Us Girls” sheet. Behind the women you can read Frida’s letter to Georgia. I finished to collage with a selection of flowers, which always speak to me of happiness and generosity. On this Mother’s Day I hope you will reach out to those women who support your creative spirit with tender affection. Strong women support each other. Flood your letters with the art of your heart. What Do You Censor…Even To Yourself? I have searched through quite a few vintage magazines lately. Seventy-seven years have yellowed the pages, but the ads have a message that today still ring out loud and clear. As women so much of our worth is tied to our appearance. The ads confirm this, marketing one product or another to make us thinner, younger, beautiful, and ultimately happier. And over seven decades, nothing has changed. While I have no qualms with anyone trying to look their best, where does the obsession for unattainable perfection become just that…an obsession…splitting us into fragments of ourselves. As artists, we are visual beings. Do you find yourself contemplating these ads? Do they influence your work, or your life? Is the search for beauty and perfection tempered with self censorship? The substrate for the collage is a stretched canvas. It is covered in metallic gold acrylic paint. 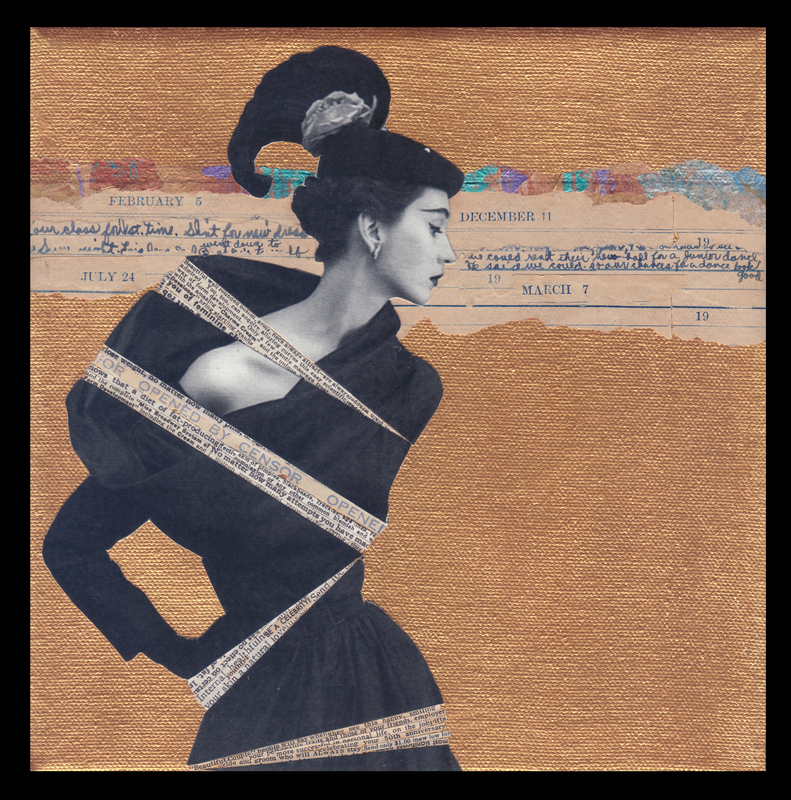 I built the collage from a fashion photo from the 1950’s, vintage magazine ads, excerpts from a 1938 diary, and handmade paper. Is Looking Through Someone Really Looking Through Yourself? Change is the only constant in life. How often have you pondered this quote? We welcome change when we feel we are moving in a direction that is good for us. We resist when we are uncertain of what a change hold for our future. 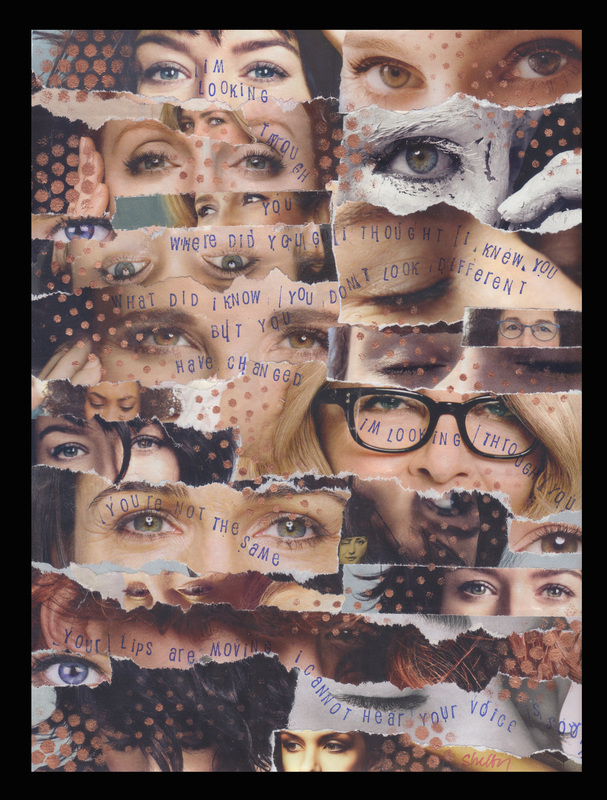 “Looking” is the theme of the Journal sent to me as part of a round-robin Journal exchange. When it arrived, it was like opening a jeweled treasure. The completed pages were incredible, glowing with colour, vision and creativity. I knew the Journal was on the way to me. Prompted by the theme, The Beatles song, “I’m Looking Through You” kept playing in my mind. The lyrics tell the story of Paul McCartney’s relationship with actress Jane Asher. At the time, they were growing apart, each following their own path. They didn’t see eye to eye on how the relationship was to move forward. The substrate for the page is heavy white paper. Working my way through a few fashion magazines I had at hand, ripping out photos I liked, I arbitrarily glued them down to the Journal page. My Muse was with me, and everything just seemed to “fit”. I got out an alphabet rubber stamp set in a font I really like. With indigo coloured ink, I randomly stamped the lyrics to the song. Stenciling metallic acrylic paint over the glued images completed the page. Change. When we become aware of a transformation in others, doesn’t it mirror a shift we are experiencing in ourselves? For good or bad, change will always be with us. How do you recognize the winds of change? They Have A Secret…Do You? There is just something about images…still and moving…in black and white that lifts my soul. I guess I’ll always be a “Turner Classic Movies” kind of gal at heart. The drama and the romance the absence of colour brings intrigued me in the past as I am certain it will in the future. The current Lunagirl Moonbeams challenge is Black & White. This time, the challenge is shared with Vicki Romaine’s challenge Blog, The Cheerful Stamp Pad. The selection of images from Lunagirl’s collection are always inspiring. Looking through the collage sheets my eye was drawn to the women in beautiful dress. What struck me was their posture…straight, proud, elegant. I loved the smile of the woman wearing the cape. Who was the recipient of her cheeky grin? Did she have a secret? I built the collage around this woman. From my own digital ephemera collection I chose a landscape I thought would have a mysterious feel when converted into black and white. And then I found my air ship! Perfect. I love the concept of the lighter-than-air ships, gracefully floating while hiding a metal frame. And why did the women stand so straight? I couldn’t resist adding the corsets…just a peek into the private lives of our ladies. 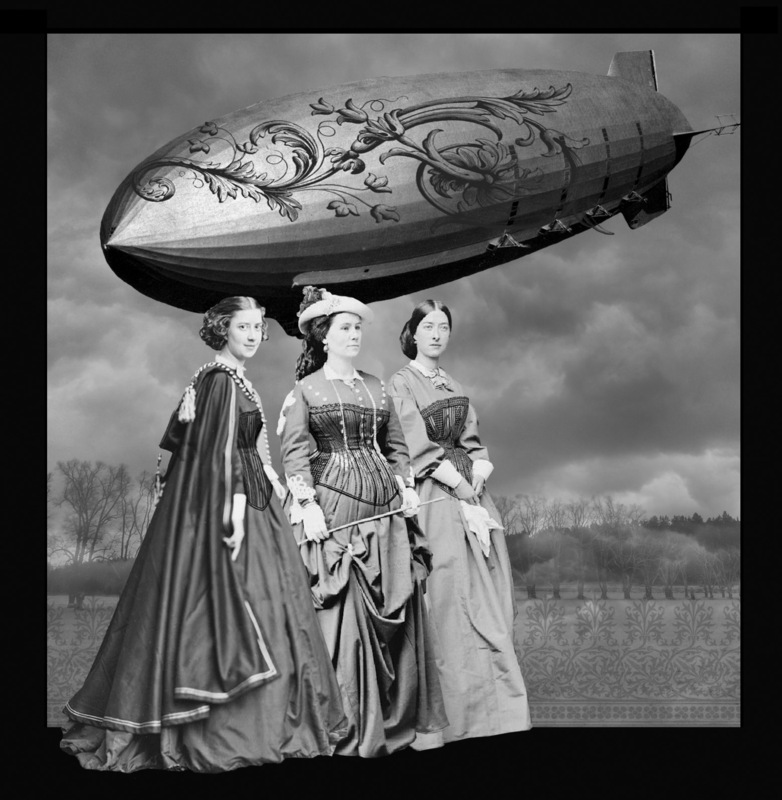 Like the airship, they are visible sophistication covering a solid foundation. And often times, the way women balance the explosive and the tranquil aspects of life is a secret only they know. But isn’t this the story of so many women? We are grace, cleverness, and power in equal measure. What is your secret? Life has an interesting way of weaving the stories of our ancestors into the fabric of who we have become. The current Lunagirl Moonbeams challenge is “Mother”. The Images sent to work with were beautiful as always. I chose the Mother and daughter engrossed in music and instrument playing. Seeing the two sitting together got me thinking about the conversation they could be sharing. Perhaps the melody was its inspiration. Many times a piece of music reminds me of someone in my life…be it my parents, or other relatives and friends. The notes of the song draw me in, and once again I am transported to a particular place and time. Could the Mother and Daughter not only be sharing memories, but making new ones of their own? The collage is a digital work. The principal image is from the Lunagirl Collection. The surrounding images are from a variety of sources. In the end, we are who are ancestors were. We learn from their triumphs and tragedies. We continue the story of their lives through our own. We can find the nurturing feelings we seek not only in the women in our lives but also in those who care to encourage us to be the best we can be. Happy Mother’s Day to you all…and to all those who support our authentic selves. On March 8th every year we celebrate International Women’s Day. With this event in mind, the March Tag Swap I joined was a celebration of women…in all our glory! “Make it Happen” is the 2015 theme, encouraging effective action for the advancement and recognition of women in all walks of life. I am delighted to see that purple is the official colour…in commemoration of the Women’s Suffrage Movement for which I have a deep appreciation. In my life, the strongest women I know are the ones who elevate other women to be the best they can be. They are the supportive, nurturing souls who are there to catch you when you fall and lift you up to greater heights in celebration of your victories. I am sure you have them in your life as well. 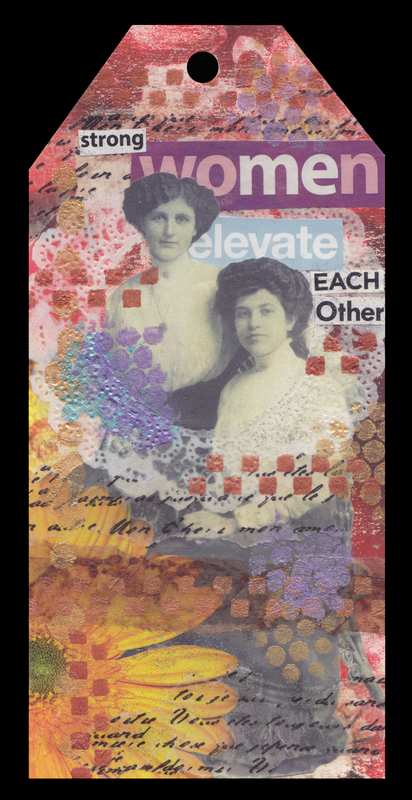 As I started working on the Tag I came across a photo two women seated together. I wondered…could they have been as enamoured of the Suffragettes as I am? The substrate for the Tag is illustration board. The background is Citra-Solv paper from a magazine article about women. I added the vintage photo, a doily, a blossoming flower, wax infused paper, text clipped from a magazine, and finished off with sponged and stencilled metallic acrylic paint in various colours. It is now on its way to a new home in California. As artists, we can “make it happen”…not only through our work, but by being that strong woman we adore having in our lives. So, my question is…Are you “that” woman? What Brings Spice To Your Life? Some time ago I signed up to participate in the “Pay It Forward” exchange. The idea is to produce a small work of art and exchange it with another participant. As I was looking through my box of ephemera, I found a line of type I had cut out of a book. It listed spices..cinnamon, pepper, sesame, anise… In the same envelope was a reproduction of a painting of a woman. Languorously reclining amid a bed of roses, she wistfully smiled. As the year drew to a close, I could imagine being her presence surrounded with a heady scent of roses and the piquant quality of spices in the air from her Holiday cooking. And it made me think…what is the Spice of Life? Is it variety as the popular saying suggests? Or is it something deeper, more personal and divine? Is it what makes each one of us unique and brings passion to everything we do? Is “spice” just another name for the magical quality we strive for in our work as artists? The substrate for the postcard is illustration board. I covered both sides of the card with gesso. I sponged the background with a selection of metallic acrylic paint. 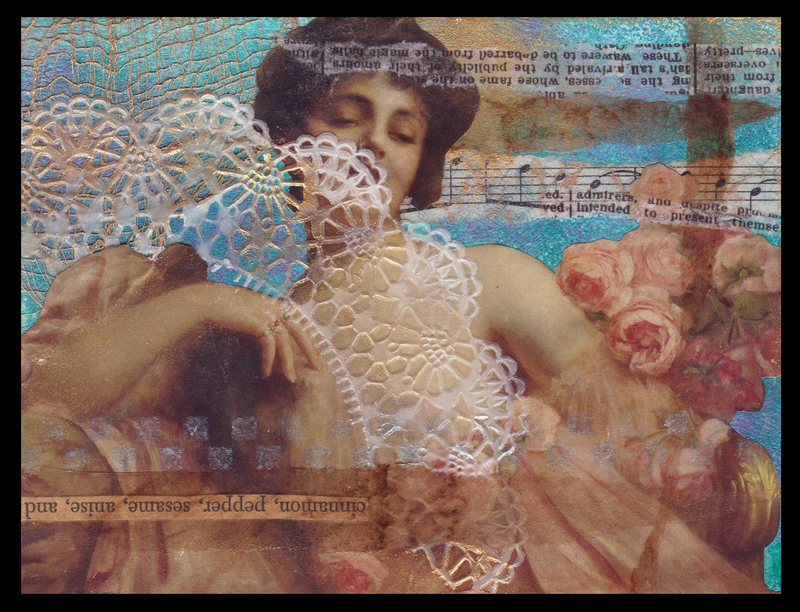 The woman, the line of type, a wax infused doily, tea bag paper, painted gauze, art and vintage papers complete the card. And off it went to its destination in Washington State. As the New Year begins we all have a chance to build a new recipe for ourselves. What will spice up your life in 2015?